From 2013 – Could radioactive material slated to be buried near the quaint town of Kincardine Ontario affect Michigan’s Thumb for the next 100,000 years? Canada’s Ontario Power Generation, is looking to find a place to bury 200,000 cubic metres of so-called low- and intermediate-level nuclear waste from the province’s atomic electricity plants. 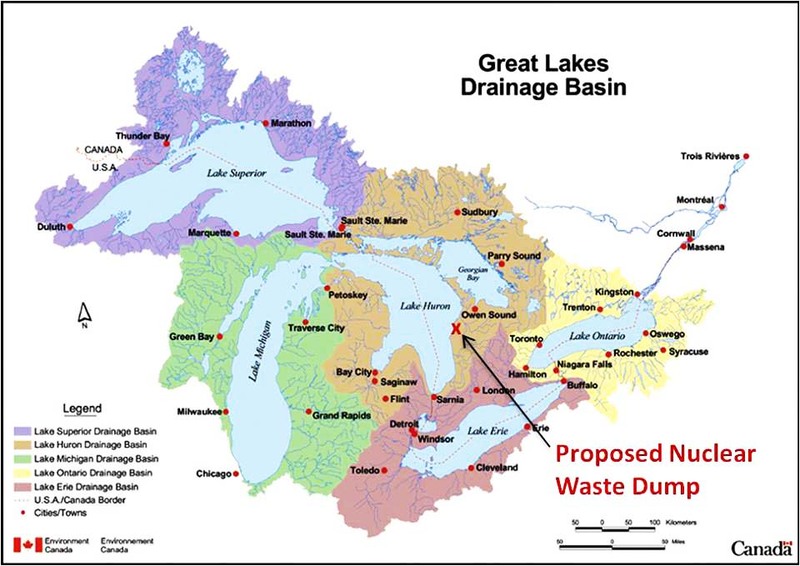 Ontario Power plans to invest over $1 billion developing the waste dump roughly 440 feet below the Lake Huron basin. When complete it could store radioactive mops to spent rods and parts. Could Canada’s Nuclear Waste be Placed Near Lake Huron? Its over in Canada but its close enough. With vast prairies and I’m sure uninhabitable area’a of Canada why next to a Great Lake?